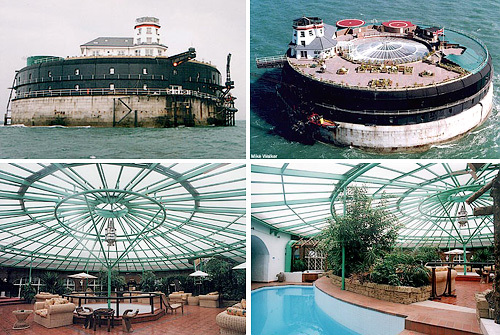 Man Made Island Fort Now For Sale | OhGizmo! Most people who dream of owning an island don’t think about the logistics involved. Sure you might enjoy that private beach and other benefits but getting other necessities like power, utilities and even building supplies can be quite a challenge. So might I suggest investing in a man made island instead that already has all the luxuries you’ve come to enjoy on the mainland. No Man’s Land Fort was originally built between 1861 and 1880 off the coast of Portsmouth, England and was designed to house up to 80 soldiers to help fend off the French Navy. At nearly 200 feet across the fort rises 60 feet above the ocean and already has generators for electricity and its own water supply. Recently the fort has been used as a luxury hotel with guests arriving by boat or using one of the islands’ two helipads. There are 21 well appointed rooms and even a heated indoor swimming pool under a large glass canopy. But I guess such isolation is not that popular a vacation resort since the previous owner is currently in jail after his company collapsed. But on the plus side it means the island is now up for sale and is expected to sell for somewhere around $8 million. Quite a steal if you ask me.